How much do you earn in comparison to your CEO? New research uncovers how much CEOs earn in comparison to employees. SmallBusinessPrices.co.uk have analysed the average earnings across different industries and locations around the world from Top To Bottom. 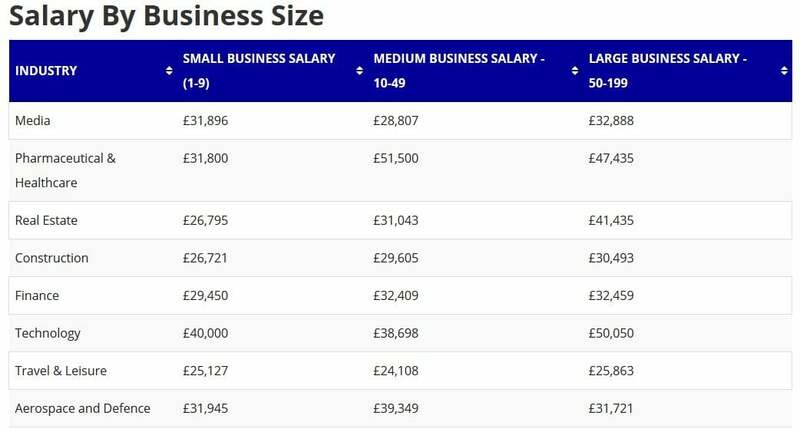 The Effect of Business Size… In a small technology business, employees earn around £40,000 on average, with medium-sized businesses salaries earning slightly less at £38,698. However if you work in a larger-sized business you can earn up to £10,000 more, with an average salary of £50,050. 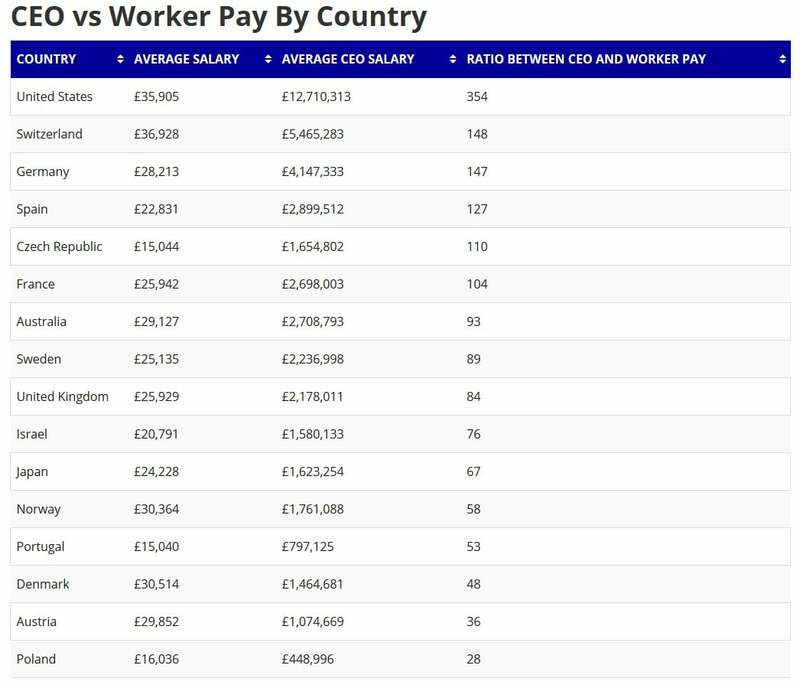 Avoid Europe For Fair Pay – 7 of the top 10 countries with the biggest gap in employee to CEO salaries are in Europe. However, Poland had the smallest ratio of wage difference from worker to CEO. Research shows that the average CEO’s salary is £5.2 million compared to the average worker’s salary of £32,489. SmallBusinessPrices.co.uk have analysed the average CEO salary, average employees earnings across different industries and the world. 1st April 2019: New research by SmallBusinessPrices.co.uk has revealed how much CEOs earn compared to their employees around the world. To take a look at the research, click here. Media CEOs saw the largest disparity between their workers, with the top dogs earning around £17.8 million on average compared to an employee's salary of £31,197. This means it only takes 0.6 days for an entertainment CEO to earn an employees entire salary. With the growing demand for construction workers, the ratio between industry CEOs and workers was 272:1. 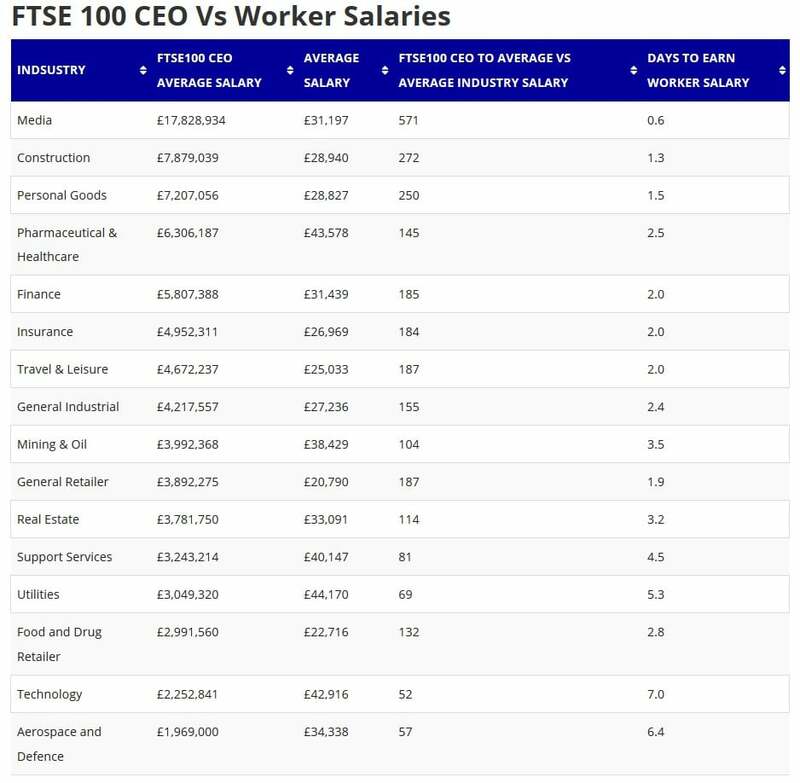 With CEOs earning around £7.9 million compared to a construction employee average wage of £28,940 - meaning it would only take a CEO 1.3 days to earn. Pharmaceuticals and Healthcare - Employees in this industry are more likely to see a larger salary if they are in a medium-sized business (10-49 employees), with the average salary being around £51,500. This is more than a large-sized business (50-199 employees) which has an average salary of £47,435. Technology - In a digital world, not only are the number of tech businesses growing but their paychecks are too. In a small business, employees earn around £40,000 on average, with medium-sized businesses salaries earning slightly less at £38,698. You can earn up to £10,000 more if you work in a larger-sized business, with an average salary of £50,050. 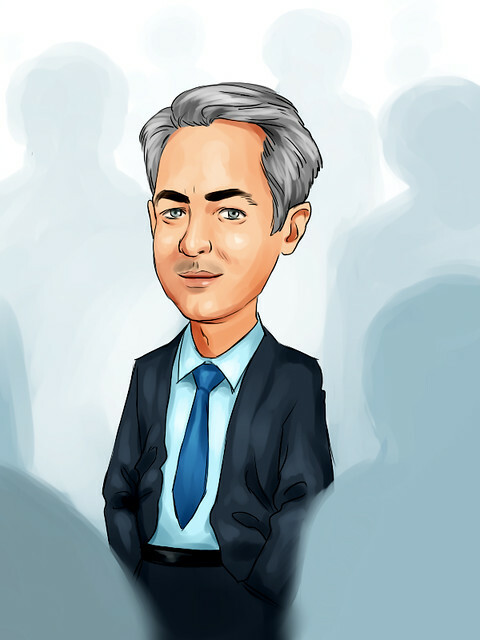 Real Estate - If you’re into the property market, the bigger businesses are your best bet. With smaller sized business employees earning £26,795 on average, this increases by just over £4,000 in a medium-sized business and in a larger company, you can earn up to £41,435. Travel & Leisure - Workers in this industry are the least likely to see their salary increase by much if they move between bigger and smaller businesses. The average employee in a small-sized business (1-9 employees) earned around £25,127, with medium-sized businesses earning less at £24,108 and larger businesses earning only £800 more than a smaller sized one. Aerospace & Defence - This industry saw the largest nosedive when it came to salaries when the scale of business was increased. On average, small-sized businesses employees earned £31,945 and medium-sized businesses employees earned £39,349, however, this dropped to £31,721 for larger businesses. The research revealed that the average American CEO earns around £12.7 million compared to the average American employee who just earns around £35,904, the largest disparity between all countries analysed. Switzerland’s CEO had the second highest average earnings at £4.7 million, with the average worker earning around £36,928 - a difference of £5,428,356. 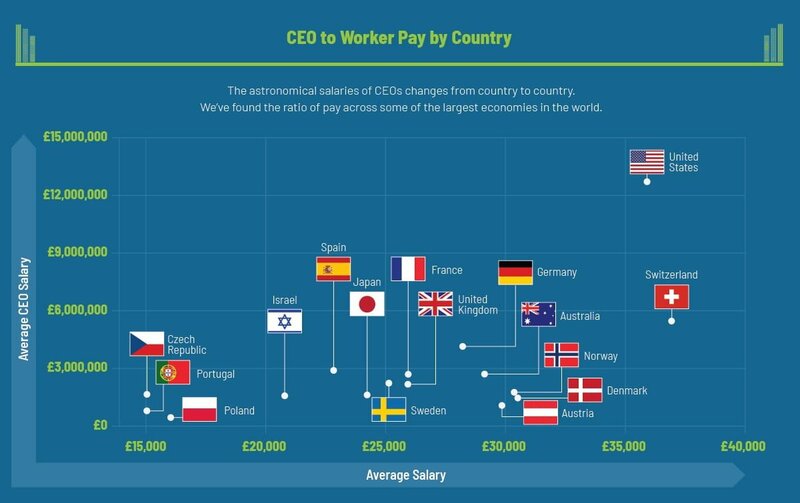 To read more about how a CEOs salary compared to the average worker or to view the full list by SmallBusinessPrices.co.uk, click here.